Food Studies – Kera Lovell, Ph.D.
After posting recently on my Global Food Studies blog about my exploration in Italy of Slow Food International as a mission and practice, I wanted to explore the world of visualizing slow food. This graphic by Daniel Touchet interestingly connects practices of consuming food (growing it, cooking it, and talking about it) with emotions, arguing that fast food is not only more anonymous but mindless and alone. I don’t know if I agree with this, having enjoyed much family time at fast food restaurants over the years, but I do agree that a faster food lifestyle is more detached from the complexity of global connections that food has to offer. Yet what are the local impacts of Slow Food? How does it affect me living in Indiana? This is a really interesting infographic produced by Oliver Uberti using pills to visualize a fish. 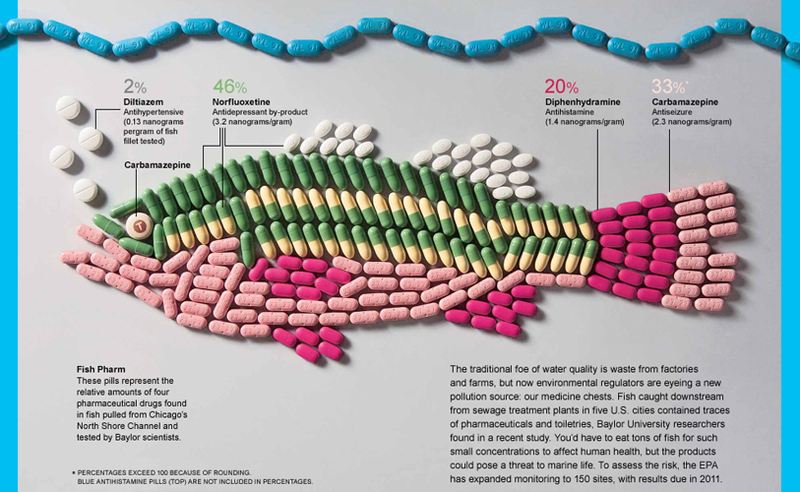 As a warning about water quality downstream from sewage treatment plants, the pills represent the four main types and percentages of pharmaceutical drugs found in fish pulled from Chicago’s North Shore Channel. Since I take a Benadryl every night to sleep, the image really resonated with me, making me think about the potential harms of the toxins I consume. This image implicitly advocates for slow food by illuminating the importance of knowing where you get your food, how it was grown, and what the harms are on your body and on the environment. Douglas Gayeton, the author of Slow: Life in a Tuscan Town, has been exploring the principles of sustainability through photography, taking abstract concepts and turning them into annotated infographics—or “information art.” It’s part an ongoing series called The Lexicon of Sustainability. 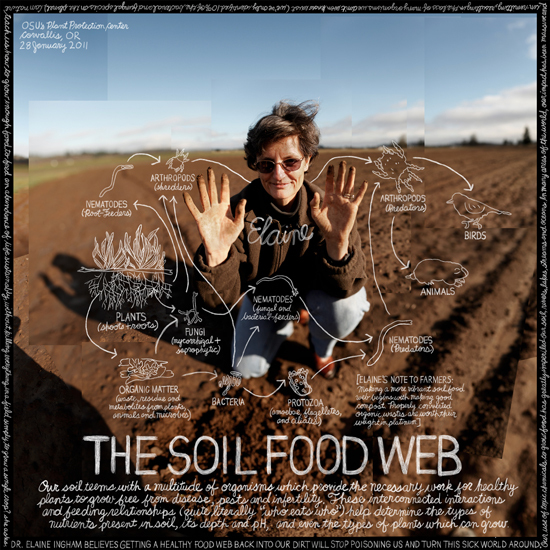 The images convey invisible or purposely obfuscated ideas related to food, and the concepts are explained by the experts themselves, like Elaine Ingham (above) translating soil science and microbiology for the masses. Another favorite visualization of slow food is this series by Douglas Gayeton who combines portrait photography with an overlaying sketched mind map. 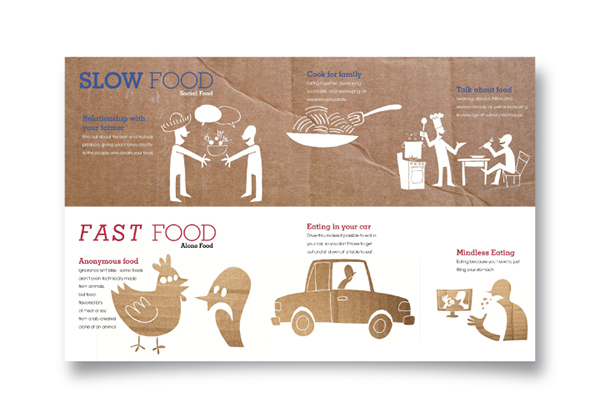 Each visual centers the slow food advocate in a graphic that aims to unpack the complexity of the food system by visualizing connections, explanations, and processes. In this graphic Elaine Ingham translates soil science and microbiology through simple sketched graphics. More than a construction actually, these images are a deconstruction of ideas, reducing them to their essence, then trying to find a way to graphically represent them. Somebody once wrote that one of the interesting thing about the work is that it works the way a mind works: If I were to simply give you a piece of paper with a lot of writing on it, you might skim over it; but if I were to take a bunch of ideas and place them on an image, then you are suddenly active in the idea. You’re active in the appreciation of the idea. That activity creates a narrative and makes it easier to retain information. You have more of a deeper connection…. It’s not a passive experience. The active experience of turning the reading of something into it’s almost a game-like quality, I think it allows people to connect more intimately with the ideas and images. These graphics are part of Gayeton’s project The Lexicon of Sustainability that has created information artworks on food and farming, water, and energy. Here’s another graphic illustrating the 100 mile diet that’s coupled on the site with definitions and links to the farmer’s website and local resources for pursuing slow, close food. This style of infographic would work best for me to visualize slow food, with a recipe for my grandmother’s pound cake overlaying a photograph of my family at her house during the summer months when her front porch table is covered in home grown tomatoes, her yard groomed by wandering chickens, her basement shelves full of home canned meals ready to be transported to Muncie where I live. When I eat her jars of pork stew, orange marmalade, and fig preserves I’m transported back to her home in Hahira, Ga where the heat and humidity make life and conversations slow and happy. My dad’s photo of Cypress Pond capturing the misty swamplands of the South. How do you see slow food? Inspired by my blog post on my farm-to-table version of a caprese salad, I explored how to visualize this recipe in a number of different ways to convey a variety of ideas, including: origin, components and hierarchy, and national meaning. 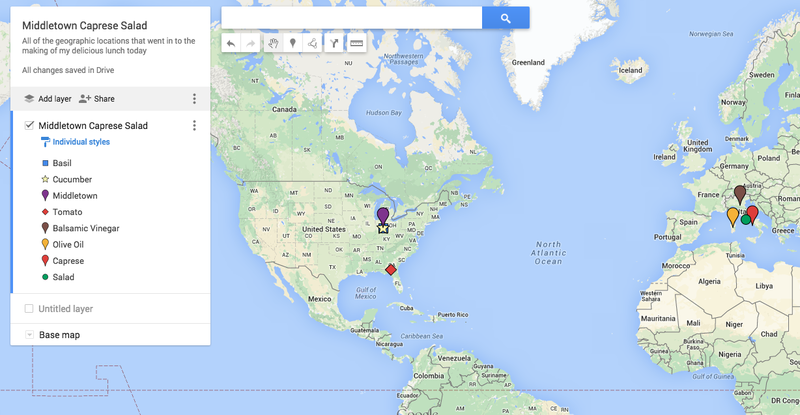 First, in a Slow Food tactic of connecting with food production on a personal and meaningful level, I plotted the geographic locations of the ingredients onto the globe using Google Maps. This representation illuminates the recipe’s transnationalism, by demonstrating the production, growth, or historical origins of each ingredient, from my backyard (basil) to the etymology of salad (Rome). For a funny picture of an Italian chef, click here. Next, I did a quick Google search for some ideas on how to represent this recipe in different ways. Here’s what I came up with. First, blogger Gratinee presents a visually deconstructed version of the recipe with whole ingredients, which highlights the recipe’s original components rather than the process, order, or hierarchy of the final product. Second, Drew Heffron at Need Supply Co. sought a new version of the pancake, and in doing so, offered a new way to visualize the precise components and hierarchy of the updated recipe. This recipe came about from a boring obsession with oatmeal. I was fed up with bland wheat flour based pancakes that relied on syrup for their flavor. I had a revelation: to make oat flour with oats and a coffee grinder. The banana give a natural sweetness so that syrup is not a necessity. The base recipe is below but feel free to throw in fruit, pumpkin puree, ground flax, etc. In some parts these are called pancakes, but I like using the term flapjacks because they’re made with oats. Although he doesn’t give an explanation for his pie chart, the image demonstrates by weight the hierarchy of the top ingredients to those in the smaller slices on bottom. Since his intention is to create flapjacks with more self-sufficient flavor, I can only assume that these more heavily weighted ingredients on top – the oats, cinnamon, banana, and vanilla – illustrate the four main flavor profiles that make up the final product of his culinary concoction. Third, I sought two different perspectives on transnationalism. 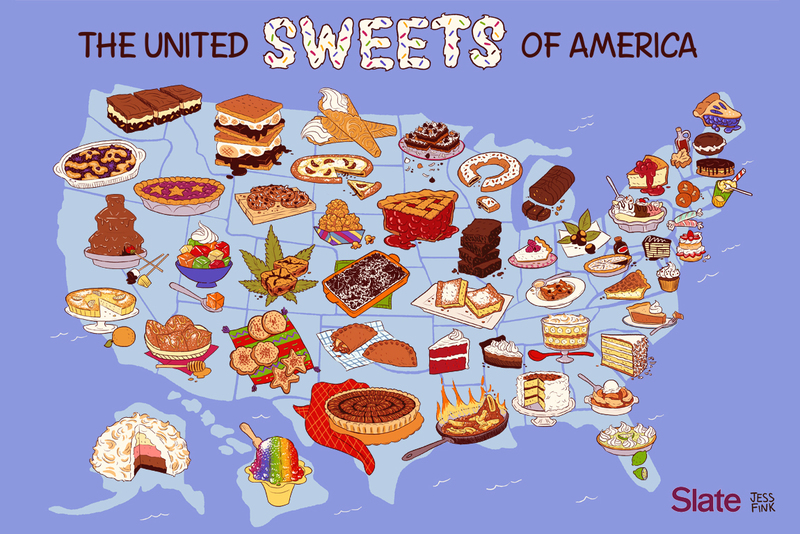 One of the classic representations of transnational food are food flags, in which you take quintessential ingredients of a particular national food culture and display them in a way that also represents that country’s flag. Although I’ll break this down on a later date (because I think these representations are SO AWESOME), Italy’s is just about the easiest one to do: green, white, and red. 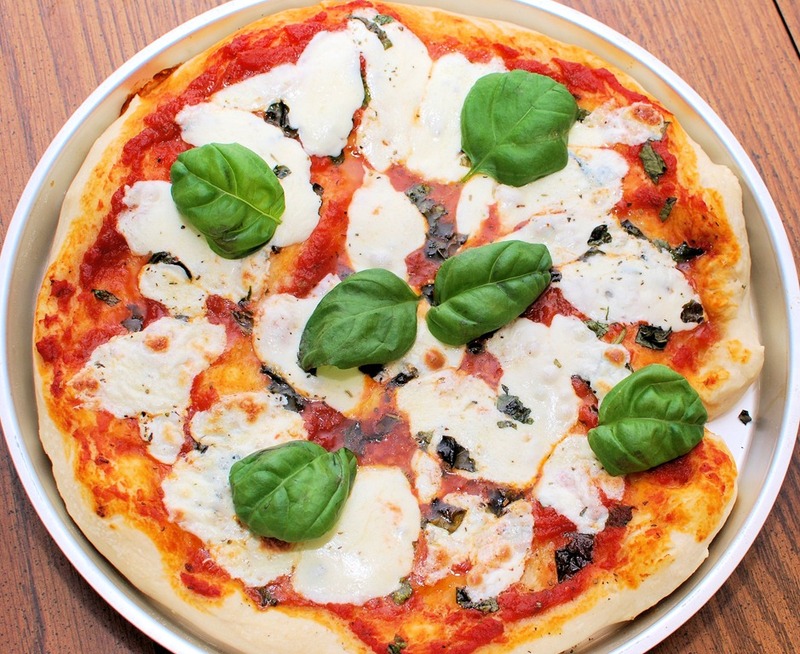 This national combination is still apparent when ordering the Italian classic – the Margherita pizza, named for Queen Margherita in 1889 according to Italy Magazine. As I noted in my blog post on my version of the Caprese salad (another Italian flag representation), a quick Google search will turn up more than 800,000 caprese salad recipes. In thinking about international adaptations of recipes, as visualized in this infographic by LONO Creative, how could I also depict the transnationalism of the Caprese Salad, on my plate and in historical origin? Is there a way to use an infographic to sort out the different varieties of caprese salad? 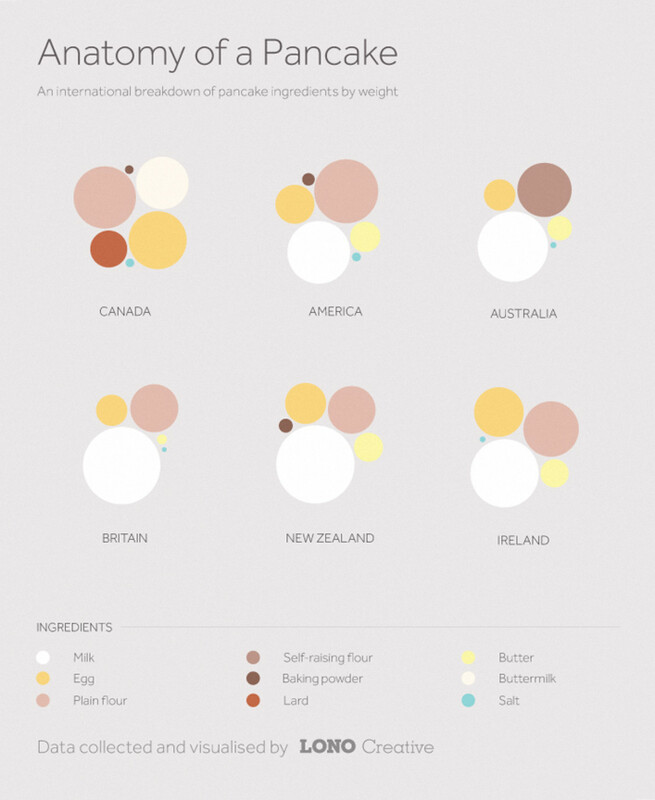 This fascinating graphic by LONO creative analyzes how different countries weight the components of pancakes differently, with Canada’s use of lard offering a resoundingly unique taste. I also couldn’t resist sharing a recipe of Canada’s classic pancake version, so try it out here. Stay tuned to see my visualization of the Middletown Caprese Salad. To begin, I want to start by connecting you with my other blog, Global Food Studies, in which I unpack my exploratory research trip to the 2015 World Expo in Milan, Italy where I analyzed transnational American food studies. In this post, I include graphics just released that visualize Dubai’s plans for its own World Expo in 2020. This is a complex infographic, and attempts to visualize three pillars of mapping that I seek to implement in my research and teaching: mapping arguments, mapping primary sources, and mapping constellations. On the left, the graphic uses world and regional maps to geographically pin point this event at the center of both the world and the region. Second, the graphic utilizes a partial aerial view to provide an overview of the park’s components, using scaled images to illuminate proximity of these components to one another. Third, on the bottom, the infographic uses photo-like renderings to provide snapshot stills of the park on the ground to shed light on the experience of seeing and being in the space at that given moment. Finally, on the right, the infographic uses graphics to unpack the park’s thematic layers while showing connecting threads between the park’s structures and its conceptual framework.